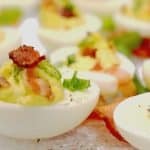 It’s picnic season here in the U.S. and few things go better at such a gathering than deviled eggs. We took this American classic and added a few touches that put it clear over the top. Place eggs in a large sauce pan. 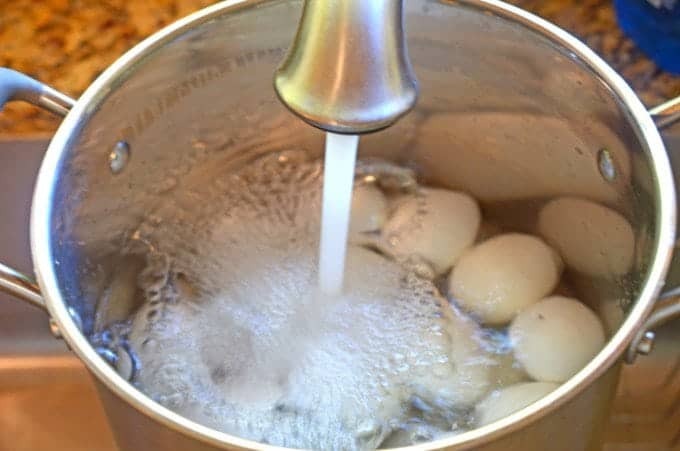 Add enough cold water to pan to cover eggs with an inch of water. Place pan of eggs and water on hot stove, bring to boil and cover. Boil for 10 minutes and remove from heat. Allow eggs to set in hot water for 10 minutes then drain hot water from pan and replace with cold tap water. Exchange with cold tap water again until eggs are cool enough to handle. Peel when ready to use. 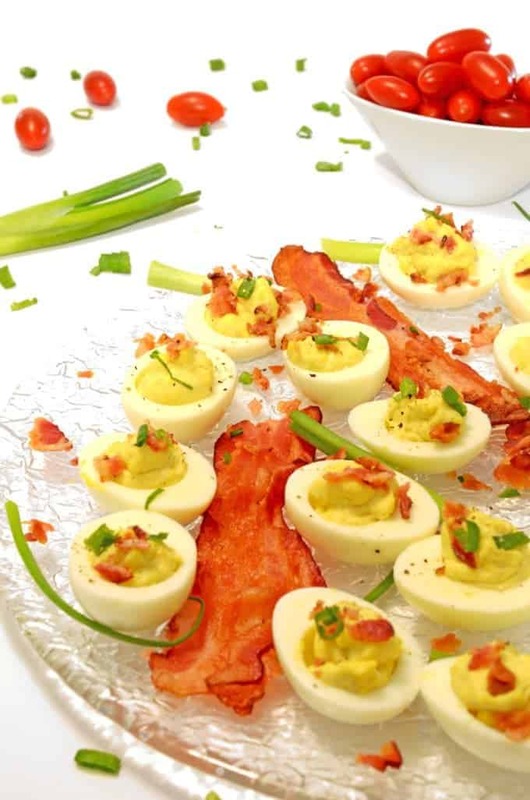 Perfect for family reunions, church functions, summer picnics and holiday get-togethers, this Bacon & Scallions Deviled Eggs Recipe is easy to make. A word of caution though: Bring copies of this recipe. Everyone who tries one of these is going to want it. Place eggs in a large saucepan; add water to cover by 1". Bring to a boil, cover, and remove from heat. Let sit for 10 minutes. Drain. Transfer eggs to a bowl of ice water and let cool completely, about 10 minutes; peel. Halve lengthwise and remove yolks. Coarsely chop 3 slices of bacon. Cook in a medium skillet over medium heat until browned and crisp. Transfer bacon to paper towels. Strain drippings through a fine-mesh sieve into a small bowl. Finely mash reserved yolks, bacon fat, mayonnaise, Dijon mustard, and chopped scallions in a medium bowl; season with kosher salt and freshly ground black pepper. Transfer to a large resealable freezer bag, then cut 1/2" off 1 corner. 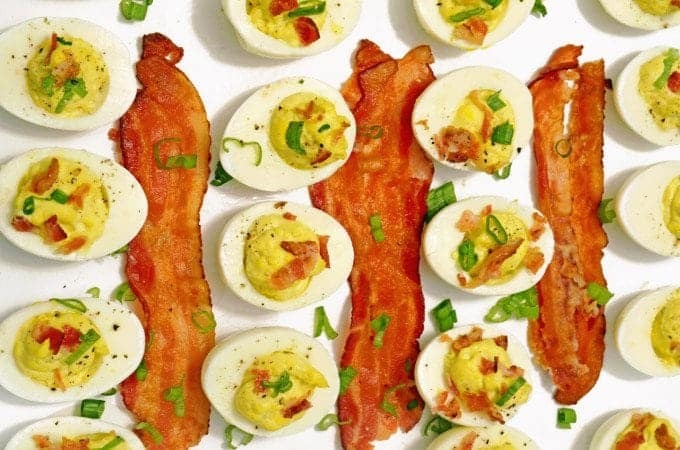 Pipe into whites; garnish with thinly sliced scallions and reserved bacon. For perfectly crispy bacon, we like to bake it in the oven. See how to do it here! 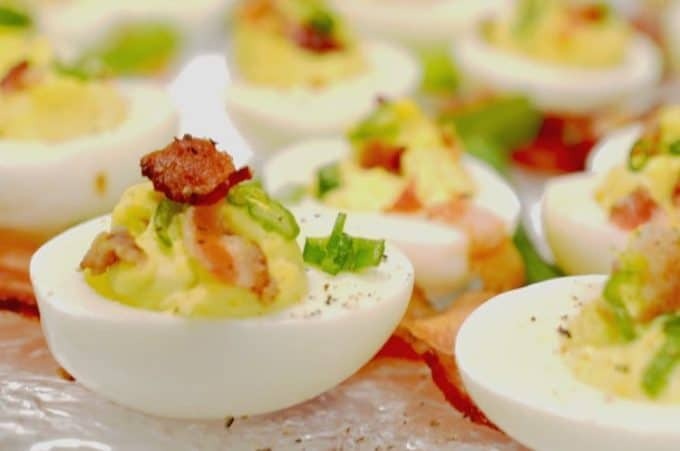 It is always the simplest things that I gravitate towards– and deviled eggs are right at the top of the list. And bacon. You put my faves together in one heavenly bite! Love!